Windows 8 with its intuitive touch interface was launched at the end of October and analysts are predicting that this operating system may bring the use of tablets firmly into the enterprise space. While the world has been going crazy for Apple’s iPad, the enterprise could see the convenience of using slate devices over laptops when mobilising the workforce. However, iOS and later the influx of the Android OS on tablets, was clearly not strong enough to handle all business needs. Tablets were mainly consumption devices. Enter Windows 8 and the wide choice of hardware. Microsoft’s own offering, the Surface tablet, is a disappointment in respects that it only runs the RT version of Windows 8, meaning customers can only use applications from the Store and not any external software. Meanwhile, other hardware manufacturers have been releasing tablets and hybrid devices that can run the full Windows experience. Both of Fujitsu’s offering, in the form of the Q572 and the Q702, run either Windows 8 or Windows 8 Pro, but are also compatible with Windows 7. While Fujitsu also insisted that Windows 8 also needs to live on the desktop in order to be successful, the company also recognises the need for tablets to be integrated into the enterprise space, to complement existing traditional desk-based solutions. The Q570 is a step up from the M532 which was a device for media consumption, running Android 4.0 Ice Cream Sandwich. The Q572’s Core i3 processor speeds up creating and editing content on-the-go. 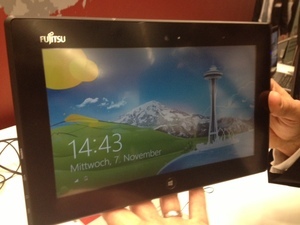 The Q572, is a 10.1 inch tablet, weighing 820g and also has 4G/LTE connectivity. The tablet comes with a stylus and also features a swappable battery. 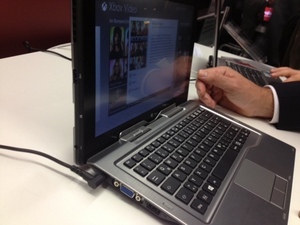 You have the option to dock the device as well as Bluetooth for attaching keyboards and also a HDMI port. Enterprise security features include a SmartCard reader, full disk encryption as well as a fingerprint sensor. 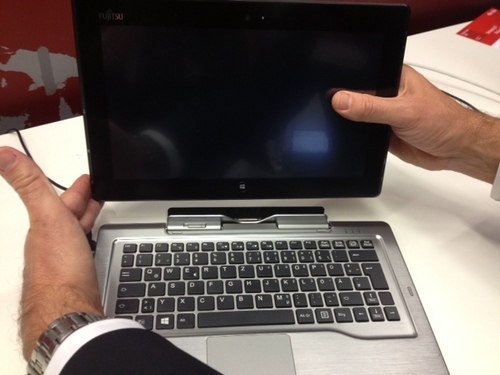 The Q702 is a hybrid device, combining a detachable keyboard with the ease of use of a tablet. This device is one step up again from the Q572, with even bigger processing power for heavy workloads thanks to the Core i5 processor (also available with the Core i3). The detachable keyboard makes the device a good option for data input, while also providing additional power. When the device is in hybrid mode, it has about 9 hours battery life, however I did find this device to be quite warm to the touch after being a display for a while. The 11.6 inch tablet weighs about 850g and so does the keyboard, so the combined weight comes to that of an ultrabook. It was quite chunky, but having option to detach the keyboard and leave it behind is very usefu. It also comes with a stylus pen, USB 2.0 and 4G/LTE support. It too features the same enterprise security features as the Q572. I found the Q572 to feel a little clunky in my hands, and while the Q702 is just as heavy, the option to easily snap onto a sturdy keyboard, reminded me of a heavier, yet much sturdier Windows Surface tablet. If you remember, I wasn’t very impressed with the Surface Touch Cover keyboard. I feel that if you create a hybrid device make sure that the keyboard is easy to use, otherwise you may as well use the on-screen keyboard to input. The Q702 keyboard on the other hand, really turned the slate device into a more familar laptop or ultrabook, with the convenience of leaving the keyboard behind when it isn’t needed and simply switch to touch or stylus mode. Both products will be available mid-December and with prices to be confirmed nearer the time.